Despite our lack of posting over the past couple of weeks, we have done a good amount of baking over Christmas. We’ve been making some repeat recipes (such as chocolate chip cookies and brownies) but a few new recipes as well, including pecan crescent cookies and this oatmeal snack cake. This cake is pretty wonderful. It is ultra moist and soft and has the perfect hint of spice in it. The topping is even better. 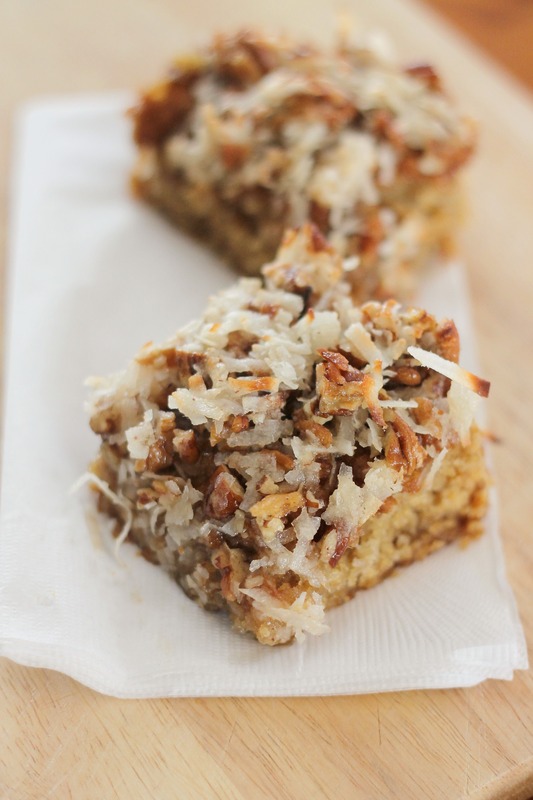 It is similar to the frosting on German chocolate cake: a brown sugar frosting with coconut and pecans. Once it is placed on the cake, the whole thing is put under the broiler for a few minutes until the topping is browned. It’s truly heavenly, with the toasted coconut and pecans and the brown sugar melting into the cake. It makes the ideal cake for making on a snowy day, which is just how we made it! We didn’t have school anyway, but it’s nice to have all this snow that hit the Northeast as an excuse to stay inside and do some baking (and homework…). Preheat oven to 350. Line an 8×8 in. metal pan with foil and spray with cooking spray. Stir together oats and water in a small bowl. Let soak for 5 minutes. In the meantime, beat together butter and sugar until light and fluffy, about 2 minutes. Beat in egg and vanilla. Whisk together flour, baking powder, baking soda, salt, and spices. Add flour mixture in two separate additions, being careful not to overmix. Stir in the oats. Pour into prepared pan and bake for 30-35 minutes, or until a tester inserted in the center of the cake comes out clean. Preheat broiler and adjust oven rack to 9 inches from the top of the oven. While cake cools briefly, stir together all the ingredients for the topping and spread over the cake. Put under the broiler for 3-5 minutes, until topping is starting to brown. Remove from heat and cool before serving. Cut into slices and enjoy!